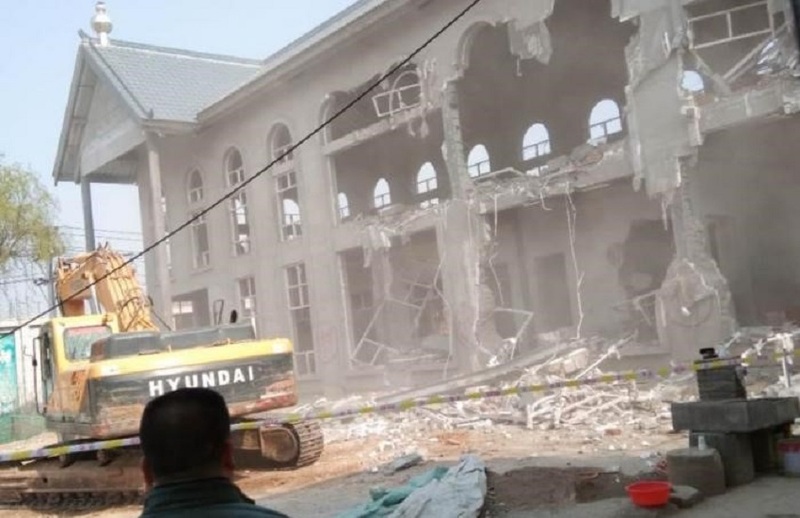 The photo depicts a bulldozer in the process of demolishing the parish building of the “underground” Catholic Church in Qianyang, China, which housed a church on the second floor and a free medical clinic for the poor on the first. The video of the event is here. This, writes Sandro Magister, is how “[t]he Chinese regime is… applying its agreement with the Holy See…” That is, its secret agreement with the communist dictators in Beijing, whose pseudo-church, the Patriotic Catholic Association (PCA), the wizards of Vatican diplomacy have now legitimated, thus betraying the fidelity of China’s underground Catholics while signing (in secret) the death warrant for the true Church in China. Note that Pope Francis, according to Magister, has indicated that Benedict’s 2007 letter condemning the PCA’s “independence from Rome” as “irreconcilable” with Catholic doctrine is still valid. Yet Francis has approved an accord which facilitates Beijing’s brutal imposition of precisely that “independence.” Francis says one thing but does the opposite. At this point, only the willfully obtuse could be surprised. Nor should anyone be surprised that it was Francis who had already overseen the demotion of Vincent Guo Xijin, the actual bishop of another diocese, that of Mindong, to the status of a mere auxiliary to Vincent Zhan Silu, “the excommunicated government-appointed bishop, installed by the communist regime in his same diocese.” This required considerable arm-twisting before Guo would “consent” to this obscene arrangement, prior to which, as Magister reports, he had been “blocked from celebrating the Paschal rites,” which he had refused to concelebrate with the impostor Zhan, and was “arrested by the police, to reappear twenty days later.” Into the bargain, Francis has lifted Zhan’s excommunication in the process of subjugating the true Catholic bishop to the schismatic one, whose primary loyalty is to Beijing. Zhan, meanwhile, has declared publicly that the only way to “the unity of the Chinese Church” is “to do away with the ‘clandestine’ Church” altogether by compelling all the Catholic faithful to join Beijing’s monstrous creation. Francis appears to be on board with this proposal. And from the Vatican, not a word to the contrary. During a recent visit to San Giulio Papa parish in Rome, Francis reportedly “confessed about himself, ‘I’ve had many doubts, many’” about the Faith he is charged to defend and protect, and he advised that young people should be taught to “doubt well” — whatever on earth that might mean. And this from a Pope who constantly derides orthodox Catholics for being hung up on doctrine while lacking a personal relationship with Jesus such as the one he evidently believes he possesses. What sort of relationship with the divine Founder of the Catholic Church would lead a Pope to lend the authority of his office to the subjugation of faithful Catholics by a communist regime, and the bulldozing of their churches while the Vatican observes a studious silence? The sort of Pope, no doubt, whose calamitous reign must figure prominently in the Third Secret of Fatima.